The Wash Futures Conference 2018 brought together the top minds, organisations, scholars and policymakers to tackle issues regarding global sanitation and hygiene. Held in Brisbane Convention Centre, the event brought together 350 delegates from 30 countries to take action on United Nations Sustainable Development Goal 6 providing sustainable sanitation and clean water for all. 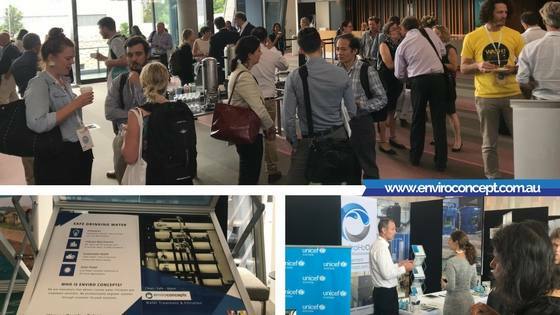 Enviro Concepts was honoured to be a participant in the event, showcasing our latest research and capabilities in water filtration and providing clean water to the world. There is a global crisis in sanitation and water. With an estimated 884 million people still lacking basic drinking water service, 2.3 billion people without access to basic sanitation, and 4.5 billion people having sanitation that is not safely managed, the Australian Government Department of Foreign Affairs and Trade partnered with International WaterCentre to bring together water, sanitation and hygiene (WASH) professionals from around the world. Behind these staggering numbers are the countless stories of struggles faced by families and children all over the world. There is an urgent need for services to meet these long-term health and environmental impacts. Some of these services include providing various forms of recycling, efficient use of water, alternative sanitation options, and water filtration technology that puts potable, clean water in the hand of the people who need the most. Enviro H2O offers commercial and industrial water filtration solutions. Our product range includes containerised Ultrafiltration and/or Reverse Osmosis units that are pre-built and deployed from our factories in Australia and installed effortlessly on site. These units can remove dissolved solids (ions), particles, colloids, organics and bacteria from the feed water, providing clean, potable water. Meeting with delegates from Cambodia, Nigeria, Malawi, Bangladesh, Sri Lanka, Indonesia, Myanmar, and Singapore, Enviro H2O executives explained how these units can be customised to fit specific projects around the world. To inquire about our units, please contact us with your questions. The United Nations Sustainable Development Goal of WASH is to ensure availability and sustainable management of water and sanitation for all. Whether it is providing sustainable WASH for rural populations, or urban water and sanitation systems, WASH conference brought both aspects to light. Enviro H2O’s inception was driven by the need for water in the communities struck by harsh drought conditions in Australia almost a decade ago. That intent has always been the driving factor for the research and development undertaken by the company. There is a huge movement within Enviro H2O to develop containerised standalone water filtration systems that can be pre-built and shipped all over the world and installed in remote locations. At WASH Futures, we shared our research, our vision, and capabilities to building and deploying such projects across the globe.